Bristol-Myers Squibb was among the best performing pharmaceutical stocks in October, launching 15% higher and tacking on more than $12 billion in market value. 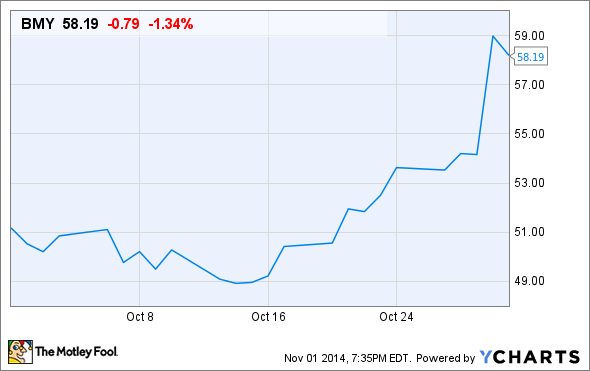 Find out what sent Bristol-Myers' shares soaring higher and whether or not it'll continue. What: Shares of big pharma giant Bristol-Myers Squibb (NYSE:BMY) shot higher by 15% in October, according to data from S&P Capital IQ, after the company reported better than expected third-quarter earnings results and released favorable mid-stage data on cancer immunotherapy drug Opdivo (previously known as nivolumab). So what: Of the two aforementioned points that sent Bristol-Myers higher and added more than $12 billion in market value in October, Bristol-Myers' third-quarter earnings results was the lesser of the two positives -- but in no way were its market-topping results negligible, either. For the quarter, Bristol-Myers Squibb reported a 4% decline in total revenue to $3.92 billion from $4.07 billion in the year-ago period. This dip was primarily a result of its divested diabetes alliance which was sold to AstraZeneca (NYSE:AZN) for what may ultimately amount to $4.3 billion if all regulatory milestones are hit. Specifically, blood-thinner Eliquis saw sales jump more than 400% to $216 million in the third quarter, while cancer drugs Yervoy and Sprycel delivered their own impressive sales growth of 47% and 22%, respectively. On a profitability basis Bristol-Myers Squibb produced $0.45 in adjusted earnings per share. By comparison, Wall Street had been looking for a profit of just $0.42 per share and a mere $3.82 billion in revenue. Bristol-Myers' year-end forecast also fell in line with the Street's consensus estimates. The bigger catalyst was phase 2 data announced on Oct. 30 regarding Opdivo as a treatment for patients with advanced squamous cell non-small cell lung cancer (NSCLC) that have progressed on at least two prior treatments. The overall response rate according to the RECIST definition was 15%, with a median overall survival of 8.2 months. Additionally, 41% of patients were still alive after one year. As Bristol-Myers notes, the average one-year survival rate for advanced squamous NSCLC is 5.5% to 18%. With few truly effective late-stage therapies Opdivo delivered some impressive results as a last line of defense and could be in line for a label expansion in the future. Now what: It's amazing what a little internal innovation can do for a company. I can't say I'm a big fan of CEO Lamberto Andreotti's "string of pearls" strategy which involves making acquisitions to invigorate growth and stave off the patent cliff. This strategy already backfired once with its Inhibitex purchase, so it's not something I'd necessarily count on to be a guaranteed growth driver. If Bristol-Myers can continue to maximize Opdivo's potential into new cancer indications, as well as grow Eliquis hand-in-hand with collaborative developer Pfizer (NYSE:PFE) into a multibillion-dollar drug, then it's possible its earnings estimates could rise dramatically. As for me, with the company already valued in excess of 20 times its 2017 EPS estimates, I'm more than happy passing on Bristol-Myers, especially after last month's run higher, and focusing on less expensive pharmaceutical companies.